so many different ways, that we have, of seeing. who will follow, of course, their own inner drum. open to the dreaming, to a sweeter song. to dance, feel happy, within this earth plane. so much to do, ‘til we feel our hearts song. according to what moves us, what we know of love. it’s their time to enjoy, everything we tell. that young souls come here, just to taste this yield. so many have come, to enjoy Earth’s view. when you decide to flow, with a different tide. out of old rhythms, all now can leap. the oneness rhythm, with its fabulous hues. or watching the breath, go along with that ride. when all sit down and open to the we. to know global harmony, and also its spell. to add your flavour, to this new cosmic ball. beaming from our hearts, like peace-filled doves. so we just come back to the heart each day. because, quite simply, anything can. they will set up patterns, to move you through realms. as like attracts like, ‘til we find true love’s rhythm. so we’ve seen great changes, in the ways that you gel. when you relax, let go, and open to above. you decide each chapter, and where you will dwell. yet there all the same, as an energy flow. about ET’s, light beings and UFO’s. to the right fields, to get the best rides. the finding of new rhythms with a pure heart song. Absorb the insights within it that are right for you. Or create your own expression of these insights. 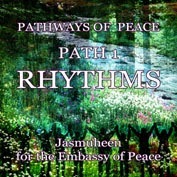 Play with your personal rhythms by applying the meditations recommended on our website at http://www.jasmuheen.com/htm/training.asp#MEDITATION-CDS. Ask your inner teacher – the divine one within (your DOW) to reveal to you the perfect rhythm so that you can know health, happiness and harmony throughout all levels of your life.